Some foot problems seem to favour women. More women than men develop bunions, callus, corns, hammertoes, and ingrown toenails. The primary reason is the shoes they wear. They are narrow, pointed, high in the heel, often flimsy, and designed for appearance rather than fit. Waiting to resolve a foot problem until it`s troublesome enough to merit a visit to the doctor is usually a mistake. Because feet are under the constant foot wear and pressure of bearing the body`s entire weight, even a small problem can grow large quickly, then take longer than necessary to clear up. It`s a lot harder to "rest" the feet than other parts of the anatomy unless you`re willing to stay in bed or a chair all day. Ninety percent of women wear shoes that are too small for their feet, and 80 percent of women say their shoes are painful. As a result, nine times more women than men are likely to develop bunions, hammertoes and other painful foot deformities because of ill-fitting shoes. Shoe Bites can occur due to wearing new or ill-fitting shoes. Feet sometimes spread and get larger with age and wear. Yet most people don`t have their feet re-measured periodically, as they should. The width of some people`s feet can increase over the years from a size B to as much as a size E, especially if their shoes are too short, and particularly after age 55. On average, women buy shoes one size too small. In one study, 90 percent were wearing shoes that were too small for them. It`s no surprise that women over age 55 have particular trouble getting a proper fit. In constructing their lines of shoes, many manufacturers start with their smallest size, perhaps 5 or 6, and build up in the same proportions to a size 8 or 10. But an individual`s heel may be up to 1/4 of an inch wider than the larger size allows for, and the toe even more. Applying a little petroleum jelly inside your shoe. Then leave it on overnight. Clean it off with a cloth and then wear your shoes. Apply coconut oil inside your shoes for three consecutive nights to soften them before wearing. You could apply castor oil too. Apply some raw potato slices inside the shoe and particularly the heel area. Repeat for two nights before wearing your new shoes. Take half cup rice. Pound it to a powder and then add enough water to make a thick paste. Apply the paste on the shoe bite. Leave it on till dry. Rinse gently with lukewarm water. Dry the feet thoroughly. You will get immense relief. Neem and Turmeric Paste: Take a few Neem leaves and add to them a tablespoon of turmeric powder. Add a little water and put it into mixer to form a thick paste. Apply this paste on the painful shoe bite. This gives tremendous relief and also dries up the bite. If you want to own a pair of lotus feet, you just need to treat them right. A little care goes a long way. Corns and calluses are both a thickening of the outer layer of skin. This thickening is known medically as hyperkeratosis. Corns and calluses develop as part of the skin`s normal defense against prolonged rubbing, pressure and other forms of local irritation. A callus can develop anywhere on the body where there is regular or prolonged pressure of friction, providing a protective pad against injury. Calluses are extensive patches of toughened skin that can occur on any part of the body, especially the feet, hands and knees since, that part of the body that absorbs the most friction on a daily basis. However, manual laborers and athletes (such as tennis players) often develop calluses on their hands, desk workers get them from resting on their elbows and guitarists have them on their fingertips. Even pushing a pen may create a "writer`s" lump where the pen presses into the finger. Calluses are not usually painful, although they do blemish the skin. A thick callus on a toe is known as a corn, and it has a hard kernel formed in the centre. Because it often presses on the nerves below, a corn can be painful. You can use corn-removing plasters, which are available from pharmacies, to remove a corn. They consist of a foam circle with salicylic acid in the centre, which eats away the plug of dead skin. Or you can visit a chiropodist who will carefully pare away the thickened layers of skin with a scalpel. Remember that for a complete cure you must remove the pressure that caused the corn in the first place. Make sure that your shoes fit properly. Corns and calluses can be a long-term problem if you consistently wear shoes that do not fit properly. Even with good footwear, you may continue to have painful corns and calluses if there is some underlying abnormality in your gait or foot structure that causes unusual stress on parts of your feet when you walk. Your health-care provider probably will ask questions about your shoes, because shoes with narrow toes are more likely to cause corns. Some types of foot problems can alter the mechanics of the foot, producing abnormal pressure on certain areas and leading to calluses. Also, any previous surgery or trauma to the feet may affect the structure and alignment of foot bones, increasing the risk of calluses. A detailed review of past medical problems, especially diabetes and circulation problems, are a routine part of the evaluation. To assess whether your corns and calluses are related to foot abnormalities, your dermatologist will inspect your feet for toe deformities, structural abnormalities of the bones, poor bone alignment and problems related to an abnormal way of walking (gait). If your doctor finds some abnormality during this part of the foot exam, he or she may suggest a specific type of padding or shoe insert that will help to prevent your corns and calluses from returning or causing as much discomfort. Apart from this, you should wear proper shoes and avoid wearing tight-fitting footwear. You should not use "corn plasters." These contain acids intended to eat away at the corns. But they also eat into nearby normal flesh. Avoid cutting corns and calluses. This only makes the situation worse. This especially applies to diabetic people. As soon as a corn develops, apply oil to soften it. Soak your feet in very diluted chamomile tea. It would soothe and soften the hard skin. Then apply a hand cream, which contains 20% urea. This will help dissolve the hard skin. Do this daily. Another formula is to soak the area in a mixture of oil of wintergreen, witch hazel, and black walnut tincture, daily. Use a pumice stone and emery board to trim down the corn or callus. Put a few drops of citric acid on the area. The next morning, use an emery board or a pumice stone and rub off the dead skin. Yet another formula is to crush 5-6 aspirin tablets and mix into a paste, by adding a half-teaspoon each of water and lemon juice. Apply this to the hard-skin areas. Put the foot in a plastic bag, wrap a warm towel around it, and sit for 10 minutes. Then unwrap the foot and scrub the area with pumice stone. The dead, hardened flesh should come loose and flake off. A variant method is to soak a piece of cotton in fresh lemon juice or pineapple. Bandage the cotton over the area. It will dissolve it. But you must be persistent. Any sweet oil rubbed on the area several times a day, plus the use of the emery board or pumice stone, will skim off the dead flesh. Try putting some lamb`s wool between the toes, to separate them (after buying larger shoes). Women should avoid wearing high-heel shoes. They ruin the feet, damage the spine, and throw the pelvic organs out of place. Women should not wear pumps; these are shoes which cause the foot to slide forward, jamming everything into the front. Instead, wear an oxford-style shoe, with laces. This properly cradles the foot. Always buy shoes which breathe and for this purpose, leather is the best. An undersized shoe will damage the toes and cause corns, etc. An oversized shoe will produce friction and break the skin. But, of the two, oversized shoes are the less harmful. Some calluses are useful, never painful, and should not be disturbed. On the feet, a small corn or callus may not cause any symptoms. However, a large, bulky corn or callus can cause foot pain and difficulty walking. Also, after prolonged irritation, a discolored area (brown, red or black) may develop under a large corn or callus. This discoloration is caused by a small amount of bleeding in the space between thick and normal skin. In severe cases, the thick and normal skin may separate, exposing the area to possible infection, especially in persons with diabetes. Ingrown toe nails are a common, painful condition that occurs when skin on one or both sides of a nail grows over the edges of the nail, or when the nail itself grows into the skin. There are three stages of ingrown toenails. In the first stage the skin on either side of the nail is red and painful to the touch. This is due to inflammation or irritation only infection. In the second stage the skin is infected and may bulge over the side of the nail. The affected area may ooze clear fluid or pus. In the third stage the skin has been infected for a prolonged time and is trying to heal itself. The skin does this by forming granulation tissue. This is heaped up extra red tissue that bleeds easily and migrates over the nail edge. There are several factors that can lead to an ingrown toenail. The first is an abnormality of the soft tissue on the side of the nail. The nail plate can be forced out of the nail groove by shoes that have a toe box that is too small for the forefoot, by trauma, or by cutting the nail back in a curvilinear fashion. Cutting your toenails incorrectly can cause them to re-grow into the skin. This occurs because the ingrown nail is often in a warm, moist and bacteria-rich environment. When the nail penetrates the skin, it provides a convenient entry for germs that can cause infection. Heredity - Inwardly curved nail with distortion of one or both nail margins. Untreated, the nail can go under the skin, causing a more severe infection. In either case, the infection needs to be cured with sterile instruments and antibiotics. The sharp end of the nail will be pressing into the flesh on one or both sides of the nail bed. Skin near the nail may feel tender and look red and swollen as the nail pushes on the skin. Once the nail pokes through the skin, the skin will look redder and more swollen. You may feel a sharp pain that is worse when walking. With time, the skin will grow over the nail. It may also cause yellow drainage come from the nail. This may mean you have an infection. Ingrown toenails need to be treated immediately. Soak the feet in warm salt water. Dry them thoroughly with a clean towel. Apply a mild antiseptic solution to the area and bandage the toe. However, If you have diabetes, do not try to treat an ingrown nail by yourself. Always call your caregiver first. Do not treat an ingrown nail without a caregiver`s help if you have certain long-term health problems. If your nail is infected or your ingrown nail keeps coming back, you may need surgery. Many types of surgeries can be done to treat an ingrown nail. 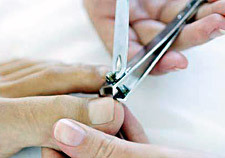 Often, a podiatrist will cut and remove a small section from the side of your nail. The section of nail is cut from the side of the fingernail or toenail that is ingrown. You may continue to have problems with a recurring (keeps coming back) ingrown nail or bad infection. If this happens, the surgeon may need to remove your entire nail to stop the ingrown nail problem.